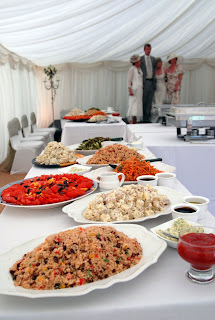 "We were delighted with the catering and so thankful to you and your staff for managing to get here through the floods! The food was absolutely delicious and much commented on by our guests. Very clever of you to produce such a barbecue feast in such adverse weather conditions! 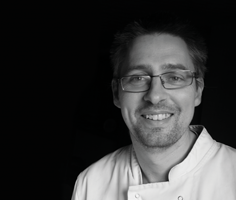 Your waiting staff were super too - all very nice people who did their job impeccably. Thank you all so much for your part in helping to make our day so special!" This is the weekend when the town became Tewkesbury-on- Sea. Unable to get to my house on Friday night (an the rest of the following week) due to 5 feet of water surrounding the town we went straight into Saturday, traversing roads to Newent that saw other drivers take one look and turn around. There were no vegetable deliveries as our vegetable supplier was surrouned by not flooded roads but lakes, so it was lucky we had been prepared the day before the rains began. It takes more than a few floods to stop us. - Sirloin steak marinated in barbeque sauce, here cooked rare. They were barbequed in batches as we served guests to prevent them over-cooking. - Chicken and leek & chicken and apricot burgers. Thesewere provided by anoher guest, also farmer who produces them. 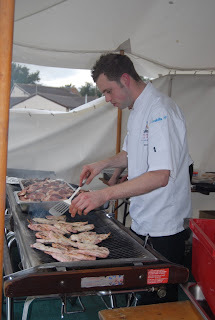 Friend and ex-Claridges colleague Adam Peirson cooks on the barbque in the catering marquee while we set up front of house.